This safe is certified Child resistant. It exceeds ASTM International safety standards for child and pry resistance, lock strength, drop/pick/saw tests and hinge attack resistance. 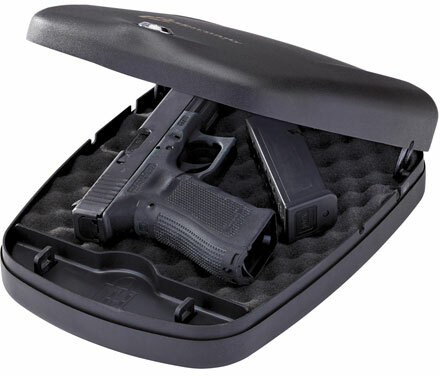 The Exterior housing is made of thick 14 gauge steel with dual internal locking lugs and 4 point capture mechanism. Included cable allows safe to be secured in virtually any location. Meets TSA requirements for handgun safety in checked luggage. A spring assist lid makes it easily open when unlocked. The contents of this item include key lock safe, tow circular barrel keys, and security cable. It will fit 1911 size pistols and some 4 inch revolvers. Model 2700KL exterior dimensions are 10.7"x8.7"x2.9" and interior are 8"x7.7"x2.2". Dimensions :8" x 7.7" x 2.2"